Since the beginning of 1990s when she started photography, the works of Rika Noguchi has been based on the unique viewpoints towards exploring the relationship between the places and the people. ‘In the Desert’ is composed of the photographs that she took for the commission of Sharjah Biennial 8, United Arab Emirates, 2007. Camels and people stand and scroll around in the desert under pale sky. 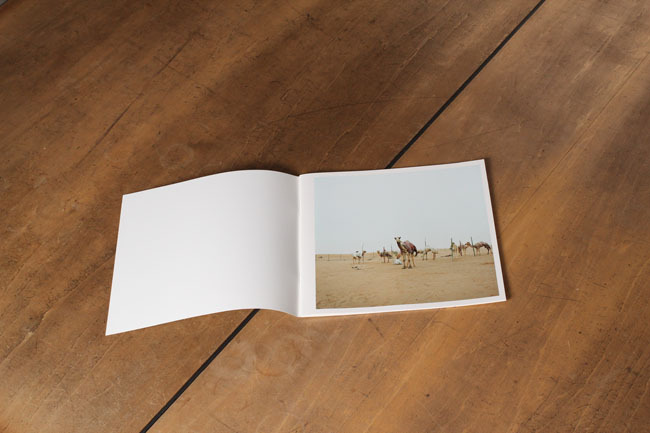 Slightly difference in scales of camels depending on her distance and the positions of subjects are balanced exquisitely and her photography filled with free and natural feeling throughout all images. Her creation of photography is like a trip to pursue some logics of the reality consisted of accumulated accidents. Her exhibition was held at the fifth national museum, the National Art Center, Tokyo, 2009.